KOTOBIAN TADAU TAGAZO DO KAAMATAN KUMAA SAVIAVI TOMPINAI DOID NOMBO NOPO...LOGOT-LOGOTON DO ARAMAI TI KIO! 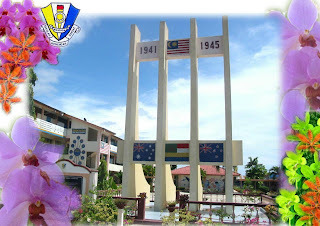 I'm back to SMK Sanzac! This is where I received my secondary education. Now, I'm here again...not as a student but as a teacher! For those of you who never heard about this school before, SANZAC actually stands for Sabah Australia New Zealand Army Corps. I'm still trying to adapt myself here as part of the teaching community. And yes...I still feel awkward being addressed as "Sir" or "Cikgu". Championships are Manchester United's trade. They understand the business in every detail and knew how to tease a win out of an exacting match at Wigan. As most people had guessed, Sir Alex Ferguson had not so much been losing a lead in recent weeks as employing it. When defeat had ultimately to be borne at Stamford Bridge, there were proceeds in the rest certain players enjoyed there before the return leg of the Champions League semi-final with Barcelona. Not even an impresario, though, could have plotted the drama and sentimental appeal of the decisive moment here. Nerves were twanging because Wigan, without insisting on too many saves from Edwin van der Sar, had some slight prospect of a comeback and United had to presume that Chelsea were going to win. Steve Bruce's men were killed off by a footballer who, with 10 Premier League medals now, has such seniority that he could almost be seen as a partner in Ferguson's enterprise instead of a mere employee. Ten minutes from the end Wayne Rooney slid the ball through a gaping central defence and the substitute Ryan Giggs steadied himself before slipping a finish beyond Chris Kirkland. The 34-year-old had also equalled Bobby Charlton's club record of 758 appearances. Hard-headed calculations mean that the spotlight will not fall too often on Giggs in the times to come and, indeed, it was Park Ji-sung who was once again favoured for a key match. There is both romance and restlessness to United under Ferguson. More, perhaps, than any other leading manager he is dedicated to the concept of perpetual revolution. He drew on the know-how of a few seasoned figures at the JJB Stadium but the process of transition is gathering pace. In a reflection of the globalisation of sport home-grown players are less common now. One of them should have been escorted away in undignified circumstances. Paul Scholes, already booked for an ugly challenge on Wilson Palacios, ought to have had another caution for the foul that stopped the Honduran from haring free on the right nine minutes before half-time. The clemency from the referee, Steve Bennett, had no justification. Indeed, it punished Wigan by denying them a numerical advantage in their efforts to claw back a 1-0 deficit. The Wigan manager, Steve Bruce, was incensed, too, that a penalty had not been forthcoming early in the match when Rio Ferdinand moved his arm into the path of a Jason Koumas drive. No one at least can quibble over the integrity of a team who, within their limitations, did all that they could to test United to the limits. Ferguson's line-up could probably not have been fluent here. The notorious pitch had been relaid but nothing runs smoothly when a squad with so many games in their bones start to weary. Cristiano Ronaldo, for instance, may have bagged his 31st goal of the Premier League season but his form is waning nonetheless. His generous efforts to advise the referee as to when he should be awarded a foul were not appreciated by either Bennett or the United backroom staff. The visitors had brought cares with them to the JJB stadium. Indeed, there was scant option but to treat the occasion as a fitness test for footballers who had no further occasions to demonstrate their readiness for the Champions League final against Chelsea on Wednesday week. Nemanja Vidic, back after being concussed at Stamford Bridge, was a straightforward case and showed the usual stringency against Wigan. There may have been greater trepidation about Rooney on his return from a hip injury in the defeat to Chelsea. He could not establish here that he was in perfect condition but his value was indisputable. Apart from setting up Giggs, he insisted on the best of Kirkland's collection of impressive stops. Rooney, at 22, is young for so established a performer and Ferguson, much as he acknowledges the faithful servants, is galvanised by the realisation that there is a batch of individuals on the staff for whom the best is yet to come. He glowed with pride that there had been 26 players whom he had felt bound to take to Wigan yesterday in recognition of their status. The United manager extolled the feralessness of Anderson, yet the Brazilian did not even make the cut to get on to the bench. While this is a United that excites, it is also attuned to conservative thinking. The lead came when Emmerson Boyce lunged at Rooney, so inviting Ronaldo to resume normal business by slotting away a penalty for the first time since missing against Barcelona in Camp Nou. The match with Wigan was merely in its 33rd minute but United would have been entirely prepared simply to guard that lead. Many of this line-up's predecessors, in more uproarious times, would have been constitutionally incapable of living by clean sheets. Nowadays the calibre of Ferguson's defence and a tactical approach that gets bodies behind the ball swiftly mean United commonly look resolved to hold what they have. If further goals should be scored, so much the better. As it was, United did buzz around the Wigan penalty area after the interval but Kirkland relished the attention to pull off save after save before Giggs, at last, left him helpless. Wigan never gave up the fight. It was a matter of honour but that earnestness did not make them incisive. The crowd's loudest gasp was heard when an Emile Heskey header from a Koumas free-kick went over the bar. Chelsea over the long examination of the Premier League fixture list. This triumphant squad is durable and its ambition, too, will not falter in the times to come. I’m back to KK…hooray! After enduring all the excruciating moment of exam, I can now enjoy the break. I would like to wish Happy Holidays to all my friends not matter where they are at this particular moment. Enjoy yourself and take care guys! My journey back to the Land Below The Wind was a mix of feelings. I was excited. I was nervous. I was flattered. I just don’t know why. To cut the long story short, I arrived at KLIA around 10.45 am and my cousins were waiting for me there. We straight away went to my cousin’s apartment to put my luggage and after that, we headed to a restaurant for lunch. I did not waste my time in KL as my main priority was SHOPPING! I was busy with my shopping until I finally realised that it was already 10 pm! OMG…KL is such a great place for shopping. I stayed there for one night only and took a flight to KK on the next day. My flight from KL to KK was boring. The journey took about 2 hours and 30 minutes. As soon as reached the immigration counter at KKIA, I heard somebody called my name. It was my friend, Romeo. Wow! He is now working as an Immigration officer. Romeo: Ko dari mana ni? Romeo: Ko study di sana ka skarang? Me: Ndak la…masih study di Kuching. Sia pi jalan2 jak di KL bah ni. Shopping2 kunun ni. Hehe..
Romeo: Wah! Bulih tahan ko ni….sampat lagi jalan2 sanaa KL. Bah mana IC ko? So, I gave him my IC and after shook his hand I headed towards the luggage claim area. While waiting for the luggage, I put on my earphones and listened to my mp3. Suddenly, I felt something was just not right. I turned to my left and shocked to see many cameramen with their state-of-the-art tools. No wonder all the people who were waiting for the luggage suddenly “lost”. They were giving way for the cameramen to shoot a drama scene! Silly me for not realizing it earlier. I guess it was a Chinese drama (not local for sure!) because I saw a tall and beautiful Chinese actress standing next to me. I assumed the production crews were shooting a scene where the actress angrily claimed her luggage from the conveyer belt. I was stunned and stuck there without knowing what to do. Yeah!! In less than 24 hours I will be sitting for my last paper. It's been an excruciating moment of waiting and I just can't take it anymore. All I want to do is to settle everything and make my way home for a long break. My packing is not yet settled and I hope to be able to finish it by tomorrow's evening. I'm almost ready to leave on a jet plane! For the time being I have to forget about it since I still have 1 more paper tomorrow. Bear in mind...exam is not yet over. So exam indeed comes first! Here I am...sitting with my leg crossed on my lovely bed. So, I thought it would be much better if I do something rather than sitting without doing anything (other than studying! Haha...). I had a dance practice today at the Brooke Hall and it was extremely exhausting. Until now I'm still tired! Nevertheless, I had a wonderful day with my friends. Joked. Laughed. Teased. It was fun! !